One of the neat things about being in Paris is walking. I have to admit that I was never much of a walker until I got my puppy earlier this year. And once I dropped 7 pounds as a result of our twice a day romps around the neighborhood, little Sasha had me hooked on the value of a good stroll around the block. But walking in Paris is something entirely different than walking in Washington, DC. To wit, my walk home last night from the Marais, an old neighborhood in the center of Paris. It was around 10pm and I was about to hit the metro, but figured, why am I heading home? I had nothing to do, but still, it’s early and it’s Paris. So I walked. The entire walk took about 45 minutes (not including a ten minute ice cream break at my favorite Italian gelato store, Amorino – they’re a chain throughout Paris, and the best damn ice cream I’ve ever eaten – equal to the best stuff in Italy). Anyway, so my walk started with the usual Marais night life, which can be a bit overwhelming unless you take a less traveled street, which I did. Then it’s quite quaint. 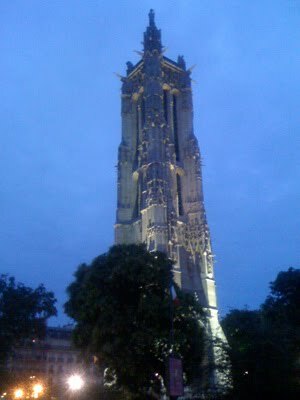 I headed down to the Tour St. Jacques, which was recently (relatively) renovated, and was standing in all its glory, bathed in green light, oddly. I looked down the block and caught a glimpse of the Hotel de Ville, or city hall. And it’s such a gorgeous building, even by day – but at night, with the lighting, it’s simply stunning. So I took a detour so I could walk by it. As I got closer, I heard music. There was some kind of concert going on, and the crowd seemed to be liking it. So I headed on over. I have no idea who the band was, but they were speaking French with a heavily English, I think, accent. As I cut through the crowd, there were a slew of bikes just standing there, and I realized – it’s 10 o’clock on a Friday night in Paris – it’s the city-wide bike ride! Every Friday night, in summer at least (not sure about the rest of the year), at around 10 o’clock at night, they close some of the streets in Paris and have either a big bike ride, or a big roller blade ride. It’s just great. I need to try it some time, at least the bike ride. So I left the bike ride before it began, cut across the river and caught a glimpse of Paris Plage, or Paris Beach. Every year they truck in tons of sand and dump it along the roadway along the Seine. Probably a mile’s worth. They then put up beach umbrellas, bring in vendors, water sprays, chairs, music, and voila! – it’s a beach in the middle of the city. It’s quite the popular event, takes place, more or less, from July 20 to August 20. You can get a glimpse of Paris Plage in the right side of the photo below. 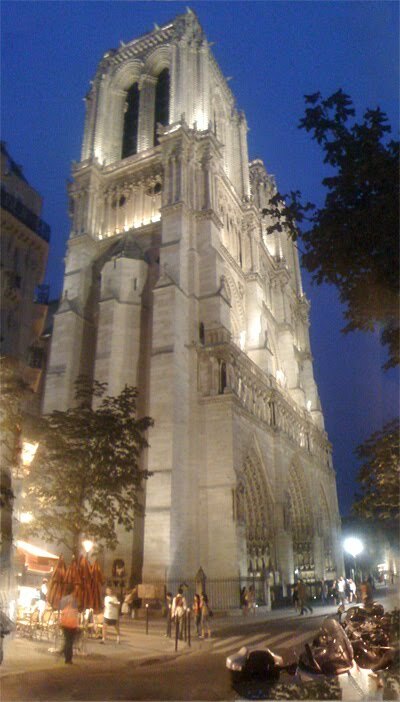 Then more trekking south until I approach, of course, Notre Dame cathedral. Honest to God, this is what it’s like walking home in this city. You just walk by the most incredible things. I stopped for a moment and looked up at Notre Dame, a sight I’ve seen probably dozens of times, but just had to look again. Then headed south, across the river (Notre Dame is on an island, basically), and heard music playing, again. This time it was a guy with a guitar serenading a pretty large crowd along the Seine. He was playing Gloria Gaynor, I think, then swung into full blown Madonna. Here’s a quick video of the guy playing – I’m pretty sure he’s singing “Like a Prayer.” I love seeing the people just sitting along the Seine, 1030 at night, couples, friends, lovers, without a care in the world. I can’t imagine sitting in any big city along a river late at night, and surviving. From there, I walked through the Latin Quarter, heading down past St. Sulpice, and then hit Amorino, and walked the final minutes home in chocolate bliss.